This tool also makes it easy to modify Active Directory accounts through its account re-provisioning templates that can be customized to suit your needs. Trying to achieve the same with just the native tools, PowerShell, etc. will only create more complications. User creation templates simplify and also standardize the process of creating new user accounts in Active Directory. These templates also allow you to save the standard or common values and formats of all the attributes which are common to many users across the organization. General Attributes like Customized formats for logon name, SAM Account name, display name, full name, etc. Account Details: Password, Group and Profile settings, Account Properties, etc. Contact Details: Contact information like Home Phone, Mobile Fax, etc. Organization attributes like Title, Department, Company, etc. Exchange Server Attributes: Mail Server, Mailbox Store, Mail alias format, Mailbox Storage limits, Delivery Restrictions, Delivery Options, etc. Terminal Services attributes: Profile, Home Folder, Start Up Program, Session Limits, Remote Control settings, etc. LCS/OCS Attributes: Communication Servers, Federation Settings, Archiving Settings, etc. Custom Attributes: Using this option you can create customized attributes for only one specific operation or add a new custom attribute permanently to your Active Directory, as per your requirement. Another huge advantage of these templates: you can assign these user creation templates to Helpdesk Technicians or even the technically novice users like HR Executives to delegate the task of creating new user accounts and offload the unnecessary burden off your back. Rule-based user provisioning: These templates also include 'user creation rules' which allow you to auto-populate the desired fields of the user accounts being created, conditionally or unconditionally, even before the user accounts are actually created in Active Directory. That is, using these rules, you can set up conditions which, on being satisfied in the user account being created, shall trigger auto-population of the specified attributes. For example, using these rules, you can set the 'manager' attribute and also the group membership for the user being created based on the value specified for the 'department' attribute. Not just user provisioning, with user modification templates and CSV import feature, you also can modify user accounts in bulk with just UI based actions. General Attributes: Container or location, Managed by, Group attributes, etc. Dial-in Attributes: Permissions for Remote Access via Dial-in or VPN. 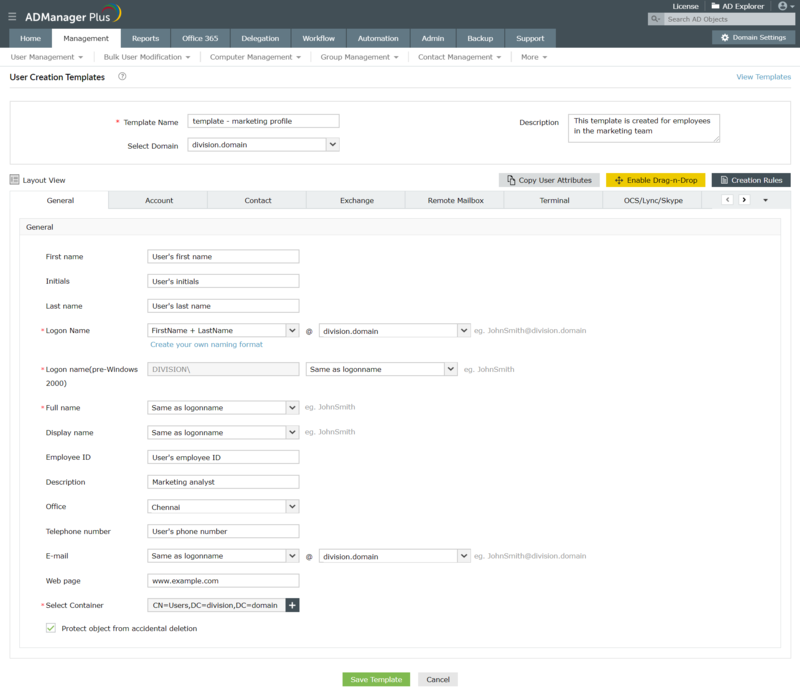 The huge advantage of ADManager Plus' Computer Provisioning templates is its 'Drag-n-Drop' customization feature. Using this feature, you can customize the template to suit your needs. That is, you can have only those attributes that you need in the templates. Also, you can make any attribute read only or editable, at just a click of the button. This customization allows you secure critical attributes of your computer accounts. 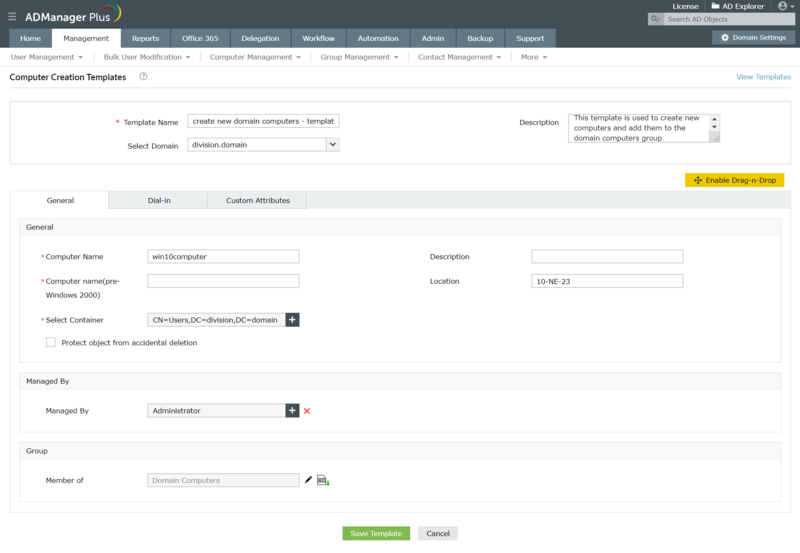 Also, you can customize the templates based on the helpdesk technicians to whom the template will be assigned and their roles, by having only those attributes that the technicians should be allowed to modify or update. General Attributes like Group Name, Container, Group Scope and Type, e-mail, etc. Group attributes like members, member of, manager, etc. MS Exchange Mail attributes e-mail alias, associated administrative groups, display name, e-mail delivery restrictions, etc. Another unique advantage of these group creation templates compared to native AD tools, PowerShell scripting, etc. is the 'drag and drop' customization component. This component makes it possible to customize the templates exactly as per your organizational requirements by making the required attributes mandatory, hidden-or read-only. Moreover, you can place in the templates only those attributes that are required by simply selecting and dragging them into or out of the templates. Based on the technician to whom you will be assigning the group creation template, you can customize it to display only the appropriate attributes and secure the critical ones by making them read-only or even hidden. This tool also offers a free download of its trial version to help you get a firsthand experience of the benefits of these account creation templates. Contact creation templates simplify and quicken the process of creating new contacts in Active Directory. They help you to create contacts with all the required settings in just one step. Further, these templates also allow you to save the values of attributes that are common to multiple contacts and reuse them while creating new contacts. General Attributes: Container, Office, Telephone Number, etc. Address Attributes: City, Country, Home Telephone, Mobile, etc. Organization Attributes: Title, Department, Company, etc. Exchange Attributes: Proxy email addresses, simple display name, delivery restrictions, etc. Custom Attributes: This allows you to create customized attributes with the option of using it for only one specific operation or adding it permanently to your Active Directory. 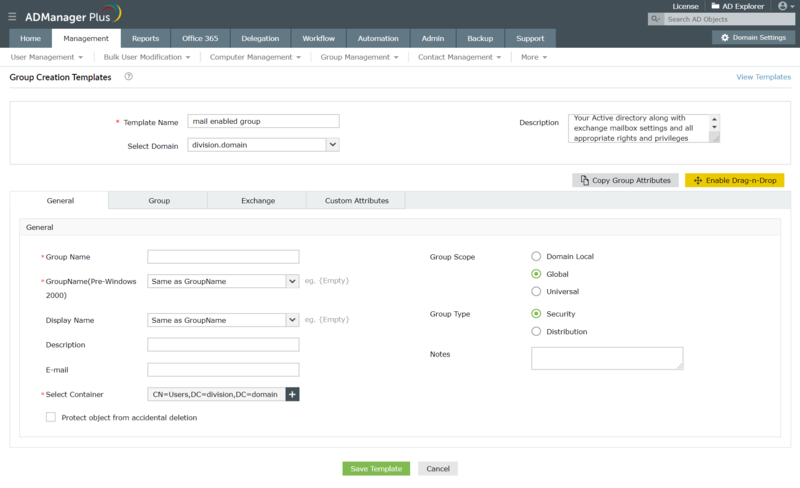 The account provisioning templates along with Active Directory workflow and automation empower you to put in place an approval-based or even a completely automated account provisioning and management system. Reduces the time and effort involved in creating new Active Directory accounts by enabling single-click creation of accounts. You can use these templates to store and reuse the standard attribute values for creating new Active Directory accounts. Allows you to standardize the process of creating new accounts by configuring the attributes of accounts with the exact values and format that you have specified as per your requirements. You can create as many templates as needed, corresponding to the number of roles in your organization. These templates can be customized to your organization's needs. For example, you can create your own naming formats for the Logon names, Email address, etc. You can assign these templates to Helpdesk Technicians to create only specific types of accounts in their designated OUs. 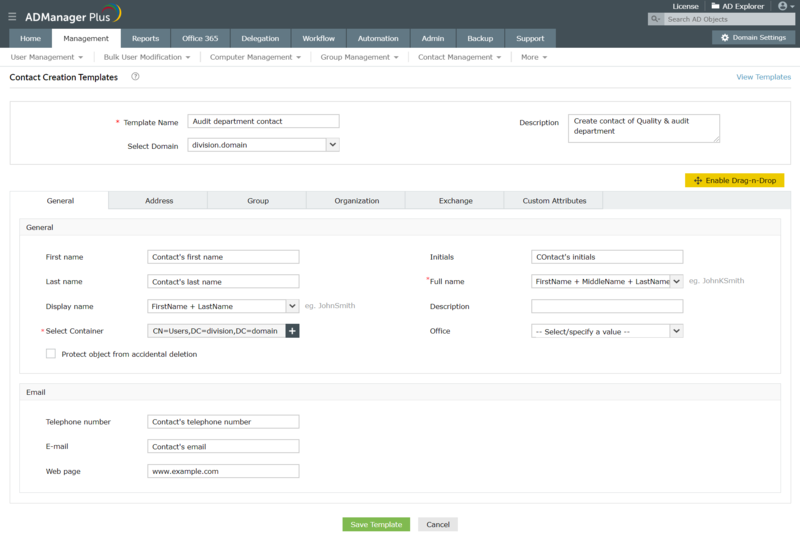 Based on the technician(s), the Department/OU or the roles for which the template will be used for creating new accounts, each template can be customized to have different sets of attributes.